By The Rev., Modestus Wirtner, O. S. B. The Very Rev. Giles Christoph, O.S.B. The Rev. Giles Christoph, O.S.B., better known as Father Aegidius, was appointed pastor and Prior in the end of February, 1862. On account of the war our merchants found themselves short in many lines of goods. In the summer when the children were to receive their first communion the women were at first in a quandry where to buy white goods. Give a woman a chance and she will find the way and means to dress. The children had their white dresses and neighbors after that complained of a shortage of white skirts. (71). Many men were drafted here for the war. Our sacristan, the Ven Brother Martin was drafted but as his services were badly needed here the congregation paid his bounty and he remained at his post. Augustine Luther was also drafted in 1862 but on account of sickness was sent home late in the fall. He was not long here when his sickness developed into a genuine case of smallpox. He was nursed back to health by his sister, Mrs. James Weakland. This was the beginning of the smallpox epidemic here in town. During the height of the epidemic we had here as high as 80 cases at one time. The epidemic spent itself in 1864. In 1863 Dr. Tidiman died. In the next year Dr. Eberstaller returned from the war, tended Weibel's case who recovered, but he himself died May 31. This left Dr. J. E. Maucher as the only physician in the town. (72). At first Father Giles, the Prior, attended personally to the spiritual affairs of the stricken patients. Often times, not only in town but also in the country he would send a man or woman to bed for a few hours sleep, whilst he would remain with the sick patient. Among others in town was Lucien Binder, who died at 6 p. m. July 3, 1863, and during the early morning of the 4th was buried. Nurses were scarce, every one dreaded the sickness. Frank Buck, immune, tended and slept with Daniel Dumm, who recovered. Bernard Carl, immune, tended many cases. Among the worst was Andrew Geis who died on Sunday, July 10, 1864 at 1 a. m. and in the afternoon was buried. In the country Chrisostom Eckenrode took sick but could get no nurse. Father Giles nursed him several days and himself took the smallpox, but both made a good recovery. In those days nothing was known about vaccination. John Groskopf was the grave digger and he marked the cemetery with many new graves. In the fall of 1863, Erhard Wirtner, son of Benjamin Wirtner left for St. Vincent's College to study for the priesthood. In 1862, the Blacklick Mission was begun. Mass was celebrated in the house of Mr. Schnabel (75), then of John Kirsch, and finally of John Soisson. On June 7, 1864, the people held a meeting to discuss plans for building a Church, disagreeing upon a location, the matter was postponed. In 1866 Father Giles selected a site on Nicholas Lambour's farm, the same that Father Lemke had reserved for this purpose when he sold the farm to Lambour in 1836. The Rt. Rev. Bishop Domenic blessed the corner stone on June 21, 1866, and on the 29th of August, 1868, blessed and dedicated the church in honor of St. Nicolas. There being a St. Nicolas in Lancaster County, the place was called Nicktown. was finished they remodeled the church of St. Lawrence at Glen Connell, of which Father Edmund was the pastor. Up to this time there was a Low Mass and a High Mass every Sunday in the church and as pews were at a premium it was thought advisable to enlarge the church. In 1867 Nicolas Freithoff, of Johnstown, received the contract of adding thirty feet to the length of the building. Nicolas Seymour burnt the brick on the monastery grounds, where town lots were sold a few years ago. Frederick Snyder and his brothers looked after the mason work. On festival occasions the church now accomodates 1000 persons. The church was blessed by the Rt. Rev. Bishop Domenic, D.D., on November the 13th, 1867. Father Giles built a large basement beneath the church, which, pro tem., was to be used as the parochial school. In the room, before it was divided, he held a kirmess which netted a nice sum towards paying off the debt of the church. The following year he intended to build the convent for the teaching Sisters. However the Rt. Rev. Abbot required his service as Prior in the Monastery at St. Vincent. Father Giles is not forgotten for the many sacrifices that he made for the members of the congregation here. The Very Rev. Benno Hegele, O.S.B. Our next pastor and Prior, Father Benno recorded his first baptism on the 17th of January, 1869. In the spring of 1870, he let the contract to build the Sisters Convent to Daniel Dumm and Francis Buck. In order to permit the Sisters to hear Mass in the church the priests' sacristy was turned over to the use of the Sisters and the boy's sacristy became the library room for the Children of Mary. A large sacristy, 25x30, was added to the rear of the sanctuary. The ladies of the Rosary Society held a fair and the money thus obtained paid for the building and the necessary furniture of the convent. The Rt. Rev. Bishop Domenic, D.D., of Pittsburgh, asked the Benedictine Sisters of St. Joseph's Convent, St. Mary's, Elk County, Pa., to send Sisters for the schools at Carrolltown and at Johnstown, which request was cheerfully granted. In the first week of October, Very Rev. Prior Benno went to St. Mary's and accompanied Srs. Luitgard Schrant, O.S.B., Benedict McGill, O.S.B., and Romana Bernhard, O.S.B., to Carrolltown. They arrived here on the 10th of October. It was dark before they reached the Convent, but some ladies of the parish awaited them and took them through the building. The Sisters found the Convent well furnished and the pantry well provided. They thanked the ladies for their kind attention to everything. (75). in connection with their studies, yea, with the discipline of the school. No labor is considered too great, no effort is spared to develop the intellectual, moral and spiritual character of the pupils, by those who have consecrated themselves to this work solely for the love and glory of God. The Bishops of Pittsburgh and Erie insisted that the new convent become independant of St. Mary's. The people of this place hoped that the mother House of the Benedictine Sisters in the diocese would be located here. Their hopes were realized in the following year when the Mother Adelgunda Feldman, O.S.B., made St. Scholastica's Convent the Mother House of the Benedictine Sisters of the Diocese of Pittsburgh. Father Benno was a priest of piety and zeal in the work of religion and especially in the care he gave to the children. The Very Rev. Aemilian Wendel, O.S.B. Father Aemilian took up the work as pastor in November, 1870. In the summer of 1871, the Rev. Wendelin Mayer, O.S.B., gave a very successful mission. Several converts are recorded to his credit. The Rev. Anselmn Schmidt, O.S.B., assisted him in the work. From here they went to the outlying missions at St. Lawrence, St. Boniface and Nicktown. A sad accident occurred at Joseph Behe's saw mill, in the northern part of the town, on Saturday, March the 23d, 1872. The boiler exploded and killed John Behe and John Zollner, whilst the fireman, Henry Behe, was dangerously injured. The boys were about 14 years of age and were numbered among the altar boys. The Rev. Maurus Lynch. O.S.B., held the Requiem High Mass for them on the 25th, the day of their burial. (76). Father Aemilian enjoyed the affection of the People In 1872 preparations were made to build the tower. However in the first week of June he was called elsewhere. The Very Rev. Amandus Kramer, O.S.B. surveyor, (after the tower had been built), who placed a square mark at the left entrance on the corner stone of the foundation, after the tower had been built. During the time that the tower was being built a peal of bells was cast by A. Fulton and Son of Pittsburgh, at a cost of $1448.42. Bishop Domenic blessed the tower and the bells on Sunday afternoon, September 22nd, 1872. The people did not go home after High Mass but ate their dinner in the school rooms where the ladies of the congregation served a splendid meal at 3 o'clock p. m. The large bell was dedicated in honor of Maria Dolorosa. Mr. Benjamin Wirtner and his wife, Mary Josephine with Philip Schettig and his wife were the sponsors. The second bell was dedicated in honor of St. Joseph. The sponsors were Peter and James Kane with their wives. The third bell was dedicated in honor of Mary Magdalin. Henry Hopple and his wife Magdalin, were the sponsors. The small bell was dedicated in honor of SS. Francis and Henry with Francis Bearer and wife Marylin, as the sponsors. When the Rt. Rev. Bishop gave the Benediction with the Blessed Sacrament the congregation heard the sound of the large bell for the first time when Father Maurus rang the bell as a sign that the Benediction was being given. (77). During the summer months the Sisters suffered from a lack of sufficient water. This situation was relieved by John Groskopf digging a thirty foot well. In the following June, 1873, a floor was laid on the ceiling of the church and the ceiling itself was replastered. The stoves were removed from the church. Graff, Hugus and Co., of Pittsburgh, placed two large hot air furnaces in the school rooms to heat the church at a cost of $1050.00. Mr. Stipler, of Pittsburgh, frescoed the church for $600.00, the church however furnished the scaffold. This work was finished on Saturday, August the 30th. The Rt. Rev. Bishop issued a circular ordering all the congregations to be consecrated to the Sacred Heart of Jesus on December the 8th, the feast of the Immaculate Conception of the Blessed Virgin Mary. Here the preparation for the event was preceded by a nine day novena, which ended by the people approaching the sacraments. The priests had a strenuous time, being kept in the confessional all afternoon and late in the night of the seventh. In the afternoon of the feast at Benediction the consecration to the Sacred Heart was made in the presence of a crowded congregation. On Sunday, March 1, 1874, The Building and the Church Committee of St. Benedict's Church met in the basement of the church and the following resolution was adopted: "We, the committee, express our sincere sorrow and heartfelt thanks to the deceased Treasurer for his zeal in promoting the interest and welfare of our church and congregation, and for his valuable services rendered to us." (78). Mr. Augustine Farabaugh, for many years held the position of janitor, firing the stoves, ringing the bells and in later years also collector and treasurer of the Church Committee. He was sick for a few weeks and after receiving the sacraments of the dying passed out of this life on the 22nd of February, 1874. Up to that time his was the largest funeral ever held here. On the 11th of July, 1875, the Rev. Anthony Wirtner, O.S.B., son of Benjamin Wirtner and Mary Josephine nee Richter, was ordained to the priesthood. Father Anthony celebrated his first Mass on July 16th, Sunday within the feast of the Patronage of St. Benedict. He was the first young man of the parish to be raised to the dignity of the holy priesthood to the great joy of his parents and to the honor of St. Benedict's congregation. Father Anthony spent the first years of his priesthood in parochial work. He was at the Sacred Heart Church at St. Mary's, Carrolltown, St. Boniface, St. Mary's church, N. S. Pittsburgh. From 1893 to 1896 he was the Director of the Scholasticate at St. Vincent's Archabbey, professor at the college for over ten years and then Subprior in the Archabbey for several years. In 1921 he celebrated his Golden Jubilee as a Priest here in St. Benedict's church. He died at St. Vincent's Archabbey on the 14th of October, 1922. He was of an amiable disposition and was highly esteemed by all. Father Weninger, S. J., gave his second two-week Mission here in 1876 during the month of June, assisted by the Rev. Benedictine Fathers Leander Schneer, Pius Preiser and Sigfried Klima. The result of the mission was a remarkable revival of the spiritual life. In the month of October a tree planting frolic took place in which most of the men took part and set out the trees in the cemetery. Today those trees tell the story how well the work was done. Every one of us has enjoyed their shade when passing around the cemetery during the Corpus Christi Processions. The Rev. Ambrose Huebner, O.S.B., who succeeded Father Maurus as assistant, was a great lover of drama and sport. He organized the Dramatic Club which gave many excellent dramatic entertainments for the benefit of the church and school. He is still fondly remembered for the great interest he took in the young people. He was followed by the Rev. Denis Stolz, O.S.B., in August, 1877. As requested by Prior Amandus he gave a sermon on usury, using the expressions 13, 15, 17, 19 per cent. charged for the use of money. At the preface of the Mass the torch-bearers went to the sacristy for their torches, and when lighting the same, one of the boys passed the remark: "Didn't N. N. catch thunder today?" Hearing this Father Denis knew which way the wind was blowing and went home. Sure enough, after Mass, N. N. created a rumpus outside of the church and was going to sue the priest. There must have been a terrific storm, heard even beyond Carrolltown, for, on Monday, it brought Hon. Robert L. Johnston and Attorney Frank Shoemaker to Carrolltown, not to see the damage done but to congratulate the young priest who was not afraid to take the bull by the horns. There was not one, but several who knew how to charge usurous rates. Well, at any rate, the money market became greatly improved, at least at Carrolltown. (79). simplicity of the Benedictine life, he dwelt in the Priory until his death, which occured on November 29, 1882, aged 86 years. The funeral was held on Saturday, 4th of December. The Solemn Requiem began at 10 o'clock. A touching and eloquent tribute was paid to his memory by the Rev. E. A. Bush, of Loretto. His remains were lovingly laid to rest in the lot set apart for the Fathers of the Benedictine Order. A neat monument marks his last resting place at the foot of the Cemetery Cross. The rooms in the basement of the church were no longer large enough to accomodate the increasing number of children. For the last two years the hall of John Wirtner was used to accomodate the girls in school. It was during the beginning of the year 1878, that Prior Amandus began the building of a brick parochial school. The putting up of the building was not a great burden to the congregation, as nearly all the labor was donated by friends of the parochial school. The brick were made in the old brickyard on the monastery grounds. The lime was donated by John Wirtner from his lime kiln near Sunset Park. John Buck and his son Celestine superintended the work as it progressed. On Monday, October 14, 1878, Prior Amandus, assisted by Fathers Valentine and Denis, as deacon and subdeacon, celebrated Solemn High High Mass in honor of the Holy Ghost to bless and enlighten those who would attend the parochial school. Then in procession they proceeded to the school, blessed the same and dedicated it in honor of St. Benedict. The Church Committee as well as the School Directors took part in the procession. When the ceremonies were over, the School Directors, D. C. Wetzel, President, J. E. Maucher, Secretary, Benjamin Wirtner, William A. Noel, John Buck and Henry Blum met and passed a resolution of thanks to their Pastor for relieving them of the burden of building a school and for promoting the cause - of the education of the children of the town. The teachers for the term were: William C. Severin, room No. 1; Sister M. Clara O'Hagan, O.S.B., room No. 2; and Sister M. Bernadine Rodgers, O.S.B., room No. 3. (80). Last March the congregation donated a plot of ground, 16 feet wide, to the town in order to make Scanlan Alley, a 32 foot road. During the summer the tower received a coat of paint. Rev. Father Boniface Wirtner, O.S.B., was ordained priest on April the 8th, 1879, and on the 20th, Sunday after Easter, celebrated here his first Mass, a Solemn High Mass at which his brother, Father Anthony assisted as deacon of the Mass. Father Boniface has spent his whole life doing parochial work. He celebrated his Golden Jubilee as a member of the Benedictine Order at St. Vincent Archabbey on July 16th, 1924. When autumn and winter are wed.
By the echo that memory wakes. And his presence to all was free. Where the summer seldom endures. May they but be near to you there." The Northern Cambria News, Oct. 18, 1879. Prior Kramer was appointed to St. Mary's Church, Erie, Pa., but the appointment was changed to the Immaculate Conception Church, Johnstown, the position made vacant by Prior Otto coming here. The Very Rev. Otto Kopf, O.S.B. The Very Rev. Otto Kopf, O.S.B., is here again as Prior and pastor. He took up his work on October 16th, 1879. Plans were made to have stone steps and a retaining wall built in front of the church. Bids were advertised in the Northern Cambria News on 22nd of November, calling for stone steps, 12 steps high and 25 feet wide and a side wall. The bid of David Ritter was accepted. The cost, including the iron fence, was $524.64. on the 30th of March, 1910. As a token of respect and esteem the congregation here presented the newly elected Abbot with a pectoral cross and chain beside a large burse. During the year 1881 Father Prior Otto had repairs and improvements made on St. Joseph's church, at Hart's Sleeping Place. The interior received a coat of paint, the exterior was weatherboarded and painted, in order to preserve it. Now it has the appearance of a neat and beautiful frame church. In the summer of 1882 a new and substantial fence was built around the cemetery here. In October 1882, the Rt. Rev. John Tuigg, D. D., Bishop of Pittsburgh, gave the Benedictine Fathers charge pro tem. Of Cameron's Bottom and Strongstown, Indiana County. The Rev. Pius Preiser, O. S. B., was sent here in October to take charge of the mission of Nicktown. To him was given also the charge of the souls of those towns. He went there every other Sunday and celebrated Mass at each of these places. This arrangement lasted one year when another assistant was sent here to help with this work. Then, from the year 1883, the congregation of Nicktown had again Mass every Sunday. In 1886, Father Pius built a parsonage at Nicktown and in the following year the priest resided there, but an assistant from Carrolltown continued to go there or to those towns to assist him. This arrangement lasted until November 2nd, 1905, when Rt. Rev. J. Regis Canevin, D. D., Bishop of the diocese united those two places to the new coal town of Heilwood and placed a secular priest in charge. (81). In 1883 Prior Otto had a retaining wall built in front of the church and convent lot and at the foot of the same a stone pavement laid by the stone masons Matthias Farabaugh, Baltasser Klein, Louis Klein and Martin Miller. A new set of the Stations of the Cross were placed in the church and blessed. As a token of gratitude the members of the congregation erected a beautiful monument in honor of Rev. Henry Lemke, O. S. B. It was placed at the head of his grave at the foot of the cemetery cross. In 1885 a new Gothic High Altar, finished in natural oak, was ordered from Germany at a cost of $3000.00 delivered at New York. Unfortunately the altar arrived in the beginning of the following year when a new tariff import duty went into effect, thus adding a cost of $833.00 as Custom Duty. (82). door; in front of the table of the altar, in the center, the lamb with the seven seals, on the right panel the Patriarch Abraham offering the sacrifice of his son, on the left panel Melchisedech offering the sacrifice of bread and wine. The first marriage performed before the altar was the following: "On June the 30th I united in the bonds of Holy Matrimony, Francis Dietrich, legitimate son of John A. Dietrich and Elizabeth, nee Sherdin and Matilda Fox, legitimate daughter of Henry Fox and Mary Catherine nee Beck. Witnesses: Henry Fox and Mary Catherine Beck. On July 8th, 1886, the Rt. Rev. Richard Phelan, D.D., Bishop of Pittsburgh, ordained to the priesthood, at St. Vincent Archabbey, the Rev. Modestus Wirtner, O.S.B., son of John Wirtner and Catherine, nee Farabaugh, and the Rev. Joseph Eger, son of Dominic Eger and Mary Magdalin Gill, the latter for the diocese of Pittsburgh. Father Modestus celebrated his first Mass here on the 11th of July, the feast of the Patronage of St. Benedict. Rev. Anthony Wirtner, O.S.B., and Rev. Boniface Wirtner, O.S.B., were deacon and subdeacon of the Mass, Rev. Denis Stolz, O.S.B., was the assistant priest, Very Rev. Prior Otto preached the sermon, Fathers Alphonse and Edwin assisted in the sanctuary. Rev. Joseph Eger celebrated his first Mass on the same day at St. Lawrence, the birth place of his mother. Father Vincent was deacon of the Mass and preached the sermon and Father Maximillian Herr, O.S.B., the pastor was the subdeacon. The Rev. Joseph Eger is the permanent rector of St. Joseph's church at Braddock, Pa., and Modestus Wirtner, O.S.B., is the rector of St. Boniface Church at St. Boniface, Pa. During the year a large beautiful Pieta statue, the gift of Vincent Rieg, was placed in the church. On July 11th, 1887, the Rev. Louis Flick, O.S.B., celebrated his first Mass here in the presence of his friends and relations. He is the son of Francis Flick and Elizabeth Jane, nee Little. In 1877 he entered St. Benedict College, Atchison, Kansas, and was ordained to the priesthood on the 29th of June, 1887, by Bishop Fink, O.S.B., at St. Benedict College. He was stationed at parishes in Kansas and Iowa. In 1898 he joined St. Mary's Abbey at Newark, N. J., and has been stationed there ever since. On the 11th of July 1912, he celebrated here his Silver Jubilee in the priesthood. Father Louis died at Newark, on the 19th of April, 1923. The Rev. Alcuin Maucher, O.S.B., son of John E. Maucher, M. D., and Mary nee Steigerwalt, was ordained to the priesthood on July 13th, 1888 and celebrated his first Mass here on the 22nd of the same month. He was stationed first at St. Mary's Pa. Then in 1891 he was appointed as one of the professors of St. Bede College, Peru, Ill. In 1893 he was made pastor of St. Vincent's congregation, Beatty, Pa., a position which he held for twelve years. Then he became professor of physics, chemistry, and mechanical drawing in St. Vincent College. In 1910 he joined the new monastery at St. Bede, Peru, Ill., and was appointed Prior, a position he held until his death on January the 31, 1913. Prior Otto, who was an upright and sincerely pious priest, left here in the beginning of December, 1888. The Very Rev. Benedict Menges, O.S.B. Prior Benedict made extensive improvements (83) during the year 1889. In early spring the large old locust trees, on the north side of the church, were replaced by the new beautiful horse-chestnut trees, or as some would have it by the buckeye trees. New pews replaced the old ones at a cost of $1258.00. The doors and window sashes were painted for $351.00. The new tin roof with extras on the church by A. C. Buck and Co., came to $1231.00 and the painting of that roof was done by Blasius A. Zollner for $86.00. Wire screen for the windows cost $286.00. Albert Flick put on the lightning rods for $65.70. D. A. Luther made an important improvement on the pulpit for $39.00, and a new sanctuary lamp was bought for $25.00. The church was frescoed by the famous Pittsburgh artist Mr. Nicholas Mangold for $550.00. When Mr. Mangold entered the church with the intention of drawing a design for the decoration of the church, he was so struck by the beauty of the high altar that he sat down to copy various features of the altar. He forgot his dinner and, before he was aware of the time, dusk forced him to quit without having drawn the first line of his design. When Mr. Mangold finished the fresco work, the interior of the church was a dream of art and a stranger, who is always welcome is at once captivated by the beauty of the high altar. In the year 1890, it was seen that the mortar in the church walls and tower was badly washed out and that the brick would suffer if further neglected. The contract of painting the walls of the church and the tower was awarded to Albert Farabaugh and his brothers. In order to avoid a repitition of this trouble it was resolved that the church walls and the tower be painted. The contract of doing this work was awarded to W. H. Pruner of Loretto, who received $1010.00 for painting the walls of the church, tower and renovating the cross with gold leaf. During the month of July and August, Peter C. Yahner at a cost of $265.00 built a frame, 16x26, two story high addition to the school house, to be used as a stage for entertainments. At the end of the year the pews were rented but the attendance at the renting was not as large as usually. The contemplated new church at Hastings kept quite a number away. It was on February the 23d, 1890, the first Sunday of Lent, that an announcement had been made here and at St. Boniface, that Rev. Edwin Pierron, O.S.B., had been given charge of the church there. Our congregation lost 60 families. On July the 19th, 1891, the church committee met and passed a resolution of thanks to Prior Benedict for the work, which he had done as pastor and as a token of regard, for his eminent services whilst stationed here, gave him a purse of $100.00. Prior Benedict left here on the 22nd of July to become a member of the new Monastery of St. Bernard, Cullman, Alabama. When the members of the Monastery met on the 29th of September to elect an Abbot, the choice fell upon Prior Benedict. He was solemnly blessed on January the 27th, 1892. The Very Rev. Raymond Daniel, O.S.B. When zealous Prior Raymond arrived here in July he found a debt of $6884.45 resting on the congregation, but before he left here the debt was reduced to about $3600.00. Prior Raymond took great interest in the school and placed it in an excellent condition. On February the 3d, 1893, a strong wind, which did much damage here, also blew the tin roof off the south side of the church. This was replaced by P. J. Dietrich, who gave a guarantee against the roof blowing off in any wind short of a cyclone. The Chest Creek Land and Improvement Co., of Curwensville, Clearfield County, laid out a town at Marx Mill, formerly McGuire's Mill (1854), six miles north east of here, and by a decree of the Court, September 9th, 1893, was incorporated as the borough of Patton. The Rev. Father Edwin, who was well acquainted with the district, was requested by the Rt. Rev. Archabbot Andrew Hintenach, O.S.B., to obtain a site for a church. On September 4th, 1892, he bought three lots, then appointed a building committee, which under his directions built a 35x55 frame church. The first Mass was celebrated in it on Sunday, October the 7th, 1893, by the Rev. Maccarius Schmitt, O.S.B. The priest resided here at Carrolltown until September the 1st, 1897, having Mass at Patton twice a month. (84). In 1891 the Brubaker Coal Co., of Hastings, extended their operations to the West Branch of the Susquehanna river. A town was laid out on the River Road in 1891, six miles west of Carrolltown, and by an order of the Court, dated November the 13th, 1893, was incorporated as the town of Spangler. Here also Father Edwin was requested to obtain a site for a. church. Accordingly in April, 1892, he called a meeting of all citizens interested in the prospective church, at which several sites were proposed, and their claim and merits freely discussed. The creek, before it was cleaned, twice sometimes thrice, overran its banks, reaching the old bed behind the Brandon Hotel. A temporary location on which the old church (now called St. Patrick's church) was, without a dissenting voice, finally selected, a building committee was appointed, funds raised, and a 35x55 frame church was built and finished late in 1893. Rev. Norbert Gerstl, O.S.B., of this place was appointed the first Pastor. (85). The Very Rev. Michael Hofmayer, O.S.B. Prior Michael is well known on the mountains. For many years he had been formerly in charge of St. Lawrence and St. Boniface. He began his work as Prior on September the 1st, 1894, and continued in the footsteps of his predecessor to wipe out the debt of the church. In September he had a four foot wide pavement made on the south side of Carroll street from main to Church street. In 1898 the imitation paper stained windows were replaced by real stained glass windows at a cost of $652.57. here visiting his relations and former friends. He is at present stationed as pastor of St. Benedict's church, Baltimore, Md. Father Aloysius is a great grandson of Conrad Luther, who was born at Thueringen, Grand Duchy, of Hesse, Germany. He was one of the troop of soldiers whom the profligate Grand Duke of Hesse sold to the English to fight against "the Insurrection" in America, as it was called in those days. He was sent to America in 1776. When the Hessians, in company with some English division were attacked near Trenton in 1777, he found out that the people were fighting for liberty and independence. Now he also sought liberty and deserted at Lancaster, Pa. Closely pursued by the English gendarms, no where sure of his life, in his flight he met Elizabeth Smith, who was bleaching linens. By a strategem of the young lady he was concealed until his pursuers had passed by, and thus enabled him to escape. He soon after joined the Continental army. Later he married the young lady, worked for the farmers of the neighborhood until 1796, when he came here. He was the third to cross the Chest Creek and made his location at Luther's cross road. He was, as he claims, a direct lineal descendant of Martin Luther but became a Catholic and was baptized by Prince Gallitzin. On June the 11th, 1893, Prior Michael blessed the corner stone of the new Holy Cross church at Spangler and likewise preached the sermon. (86). The Rev. Agatho Strittmatter, O.S.B., son of Andrew Strittmatter and Catherine, nee Zorn, was ordained to the priesthood on July the 13th, 1899, celebrated his first Mass on the 23d of July. Father Vincent preached the sermon on the occasion. He is now stationed as pastor of the Sacred Heart church, Boulder, Colo. The Rev. Denis Severin, O.S.B., son of William C. Severin and Catherine, nee Sharbaugh, was elevated to the holy priesthood at the same time and celebrated his first Mass on the 16th of July. Father Denis is now the Rev. Procurator of St. Bede Monastery, Peru, Ill., a position which he has held for many years. Prior Michael has always proved to be an efficient, careful, and successful pastor, accomplishing much in the mental and spiritual interests of his people in the different cities and towns where he had churches, and winning worthy commendation in his other fields of important labor as teacher and pastor. The Very Rev. Emmeran Singer, O.S.B. In the year 1900 all the native born priests held a reunion here on the occasion of Father Anthony Wirtner's Silver Jubilee to the priesthood on July the 29th. (87). Father Anthony was the celebrant of the Solemn High Mass, Fathers Boniface Wirtner and Modestus Wirtner were the deacon and subdeacon of the Mass. Father Alcuin Maucher was the Master of Ceremonies. Father Vincent Huber delivered an excellent sermon on the priesthood. In the sanctuary were the Fathers Aloysius Luther, Denis Severin, Agatho Strittmatter, Maurus Hartman, and Joseph Eger. The Rev. Louis Flick and Thomas Ott were the only ones absent. Preparations were now made for the Golden Jubilee of the church. New vestments were bought and other things necessary for the occasion were put in order. Rt. Rev. Leander Schnerr, O.S.B., Archabbot of St. Vincent Archabbey, visited the congregation and on Sunday the 10th of March, 1901, gave the Papal Blessing after High Mass. Prior Emmeran announced on the 20th of May, that in future all pew rents should be paid to the priest directly, he would also personally take care of the church books. The Golden Jubilee of the Dedication of the church was celebrated on July the 28th, 1901. The celebration was postponed from the previous Christmas the exact anniversary, because the severe weather, that prevails at that season in the Alleghenies, would render it next to impossible for the Venerable Prior Celestine, who was the pastor and minister of the dedication fifty years before and other survivors to be present. The town was gaily decorated for the occasion and every household contributed its share to make the celebration a success. The first event of the day was the parade from the parochial house to the church which began at nine forty-five. The procession was headed by the cross bearer and two acolytes followed by a great number of children, dressed in white and wearing the Papal colors, gold and white. The priests, local and visiting, followed and the line was closed by the Rt. Rev. Archabbot of St. Vincent Archabbey. At ten o'clock Pontifical High Mass was celebrated by the Rt. Rev. Archabbot Leander Schnerr. The Rev. Vincent Huber, rector of St. Bede College, Peru, Ill., was presbyter assistant, deacons of honor: the Rev. Louis Flick, of St. Mary Abbey, Newark, N. J., and the Rev. Aloysius Luther, of St. Bede College, Peru, Ill. The Rev. Alcuin Maucher and Rev. Agatho Strittmatter of St. Vincent Archabbey, were the deacon and subdeacon of the Mass. The Rev. Anthony Wirtner should have delivered the sermon, but being very ill, his brother Father Boniface, delivered the sermon, which, notwithstanding the shortness of time for preparation, was an excellent and appropriate sermon. All the priests whose names are mentioned above, with the exception of Father Aurelius Stehle, are natives of Carrolltown, and to them must be added Rev. Maurus Hartman, who was present in the sanctuary. In the sanctuary were also the Rev. Ferdinand Kittell, of Loretto, the Very Rev. Prior Celestine, whose mind could link the function of the hour with that of fifty years before, the Very Rev. 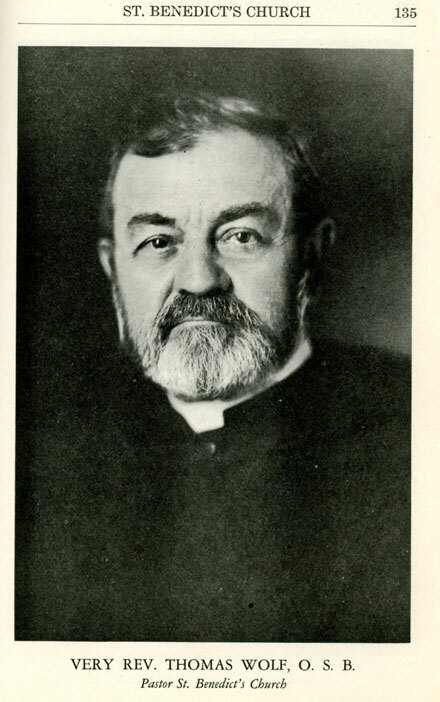 Eugene Phelan, of Atchison, Kansas, the Very Rev. Paulinus Wenkman, of St. Mary's Pa., the Very Rev. Theodore Schmitt, of Erie, the Very Rev. Singer, Prior of Carrolltown, and his two assistants, Rev. Stanislaus Messmer and Rev. Leonard Schlimm. The church was crowded to its utmost capacity. It was lavishly and handsomely decorated, the Papal colors predominating. Benediction of the Blessed Sacrament was given. The celebrant was Father Maurus, assisted by Fathers Denis and Agatho. On Monday morning, July the 29th, at nine o'clock, there was Pontifical Requiem High Mass, celebrated by the Rt. Rev. Archabbot, with Rev. Fathers Maurus and Denis as deacon and subdeacon, for the deceased members of the congregation. At this Mass a delicate and touching sermon on the necrological history of the parish was preached by the Rev. Vincent, the pathos of which was no doubt deepened by the remembrance of the many members of his own family at rest in the neighboring cemetery. After Mass priests and people went in procession to the cemetery, where is the grave of Father Henry Lemke, the founder of the Carrolltown Mission. (88). The Rev. Agatho Strittmatter, O.S.B., celebrated a Solemn High Mass, October 7, commemorating the Golden Wedding Anniversary of his parents, Andrew Strittmatter and Catherine, nee Zorn. The Rev. Charles Boley, son of Joseph Boley and Cecelia, nee Herzog, of Bradley Junction, paid us a visit on the 6th of January, 1902, celebrated a High Mass for his deceased relations. Rev. Boley is a grandson of Thomas Herzog and Mary Ellen, nee Wasser, of St. Joseph's church, Hart's Sleeping Place. On the fourth Sunday after Easter, April 27, fire destroyed the Monastery. The fire started on the roof at the chimney. Before the year was over Prior Emmeran had the building rebuilt. Rev. Clement Strattum, O.S.B., came here to look after the spiritual welfare of the Catholics at Bakerton. In August he began to celebrate Mass every two weeks in the Miners' Hall. Beginning with the month of October he celebrated Mass there every Sunday. (89). The Labor Day picnic netted $500. This put life in the movement of building a church. The farmers, however, were not in favor of the movement. Andrew White donated about a half of an acre of ground to the church. William McCombie erected the 80x35 foot frame structure. On the 15th of August Father Clement celebrated the first Mass in the new Sacred Heart church. The week following the plasterers arrived and plastered the building. Father Clement left here on August 18th, 1904. The following dates are the dates when his Reverend successors administered their first baptism in the church: Wolfgang Kolbeck, O.S.B., November 28, 1904; Thomas Wolf, O.S.B., September --, 1905; Herman Schorer, O.S.B., January 18, 1911; Berthold Neuhauser, O.S.B., September 7, 1913; George Brugger, O.S.B., June 5, 1920; Richard Kraus, O.S.B., August 22, 1920. The church was placed in the hands of the Rt. Rev. 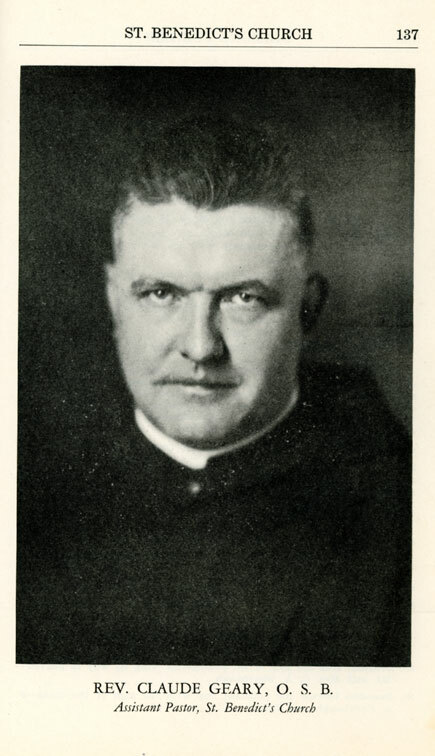 John J. McCort, D.D., Bishop of the Diocese, who put Florence J. McCarthy in charge. The Rev. McCarthy entered his first baptismal record on February 21, 1921. Prior Emmeran left here on July 18, 1904, to fill an appointment as Prior of St. Mary's church, North Side, Pittsburgh. He was a priest of piety and zeal in the work of God. The Very Rev. Leopold Probst, O.S.B. Prior Leopold began his work as pastor on the 24th of July, 1904. On September 4th, he called a meeting of the farmers to arrange matters in regard to a new hitching ground. A large attendance of men was present. It was decided that the old hitching ground should be vacated and that the plot of ground be added to the cemetery. Later the following gentlemen, William Biller, Charles Yackle, Henry Buck, and Andrew Strittmatter acted as a committee with the pastor in allocating places in the new hitching ground and in directing the erection of sheds to protect the teams against the inclement weather. The old plot was then laid out into cemetery lots and blessed on All Souls Day. (90). During the first week of October a large delegation of parishioners went to Erie, Pa., to be present at the funeral of Very Rev. Celestine, 0 S. B., who died on the second of October. Prior Celestine dedicated the church here on Christmas Day, 1850. In the following year, 1905, the Passionist Fathers of Pittsburgh, gave a very successful mission here which began on May the 28th, and ended on June the 8th. Father Vincent Huber, O.S.B., celebrated a Solemn High Mass on July 25, commemorating the 25th anniversary of his ordination to the holy priesthood. On July the 16th an announcement was made that the contract was signed for a new organ. This organ was dedicated to divine Service on August the 6th, 1906, and in the evening of that day a sacred concert was given in the church to a large audience. In the following month an extra collection was taken up to pay the painter and decorator Mr. Burr, of Ebensburg, who was to decorate the church during the following spring. On June the 10th, 1907, Rt. Rev. Eugene Garvey, D.D. dedicated the Sacred Heart church at Bakerton. Father Herman sang the High Mass, at which the St. Benedict choir rendered the music. The Bishop delivered the sermon. His theme was "Charity". Father Thomas Wolf O.S.B., was the pastor. (91). During the month of July natural gas lights were placed in the church. On the 22nd of September, at 3 p. m., the new terra cotta Stations of the Cross were blessed. During the following week many people went to St. Vincent Monastery to be present at the funeral of Father Otto Kopf, O.S.B., who died on September the 27th. The Rt. Rev. Eugene Garvey, D.D., administered the sacrament of Confirmation to a large class of children on Sunday the 6th of October. The Young Men's Institute made use of this occasion to hold a meeting on the evening of the 5th in Chester's Hall, at which Bishop Garvey was the speaker. He took for his subject: "His trip to the Holy Land". The Bishop in a beautiful manner gave a historical account of the journey which was both instructive and entertaining. (92). the Catholic Church of the Latin Rite. All of our liturgical ceremonies are conducted in the old latin language. Sometimes we are called Roman Catholics, because our Chief Bishop the Pope, resides at Rome. On February the 29th, 1908, the Ebensburg Council, No. 522, Knights of Columbus held their memorial service in St. Benedict's church. A Solemn High Mass of Requiem was celebrated, at which the Rev. Herman officiated with Rev. Thomas and Rev. Leopold, as deacon and subdeacon. An elegant address was made by Rev. Richard Farrell, of Spangler. He paid a glowing tribute to the memory of the Rev. Prince Gallitzin and Father Lemke, and to the work accomplished by the Benedictine Fathers, how, by their zeal and devotion, they have imbedded Catholicity into the hearts of their parishioners; also of the noble work done by the Knights of Columbus and impressed upon them the responsibilities which the future may have in store for them. (55). During the latter part of May ground was broken for enlarging the parochial school. The enlarged building, costing $11,687.00, consists of eight rooms and a large hall on the second floor. The second story is divided into rooms by portable partition so that the entire floor may be thrown into an assembly room. On Sunday, October the 4th, a Solemn High Mass was celebrated at 9:30 a. m. After the Mass the school children, the various societies, the band and the choir, the Rt. Rev. Archabbot with his assistants followed by the members of the congregation, marched in procession to the school house. The ceremonies of the dedication were carried out according to the Roman Ritual by the Rt. Rev. Archabbot Leander, O.S.B., of St. Vincent Archabbey, Beatty, Pa. The Rev. Edward Andelfinger, O.S.B., of Greensburg, delivered an eloquent sermon. The procession returned then to the church where Solemn Pontifical Benediction with the Blessed Sacrament was given. (93). Scanlan street side walk was lowered to the proper grade and a brick side walk was laid thereon as well as on Carroll and on the street in front of the school house. A central heating station for heating the church, school and convent was also built. The Rev. Father Alphonse Heimler, O.S.B., who made his home with Father Raphael at St. Boniface, died on the 13th of August, 1909, of diseases incident to old age at an advanced age of 78 years. The funeral took place on the 16th from St. Benedict's church and the interment was made in St. Benedict's Cemetery. Benjamin Wirtner, Vincent Reig, James Kirk and Thomas Sharbaugh presented the church with four confessionals which were made to conform to the Gothic style of architecture. Andrew Strittmatter donated the pulpit which was built according to the same style. The Rt. Rev. Abbot Vincent Huber, O.S.B., of St Bede Monastery, Peru, Ill., visited his old home and on the 15th of August celebrated a Pontifical High Mass. On the next day, the 16th, the Rev. Thomas Wolf, O.S.B., who had the spiritual charge of St. Joseph's church and of Bakerton, sang a Solemn High Mass, commemorating the 25th anniversary of his ordination. Prior Leopold was called home to St. Vincent Archabbey to teach philosophy to a class of seminarians. Prior Leopold is a classical scholar, a pleasant gentleman and an energetic worker, his pastoral labors have been crowned with gratifying success, while his administration has been characterized by prudence and justice. The Very Rev. Thomas Wolf, O.S.B. Prior Thomas was appointed pastor in August, 1910. He found a large debt resting on the congregation but by diligent work succeeded in paying off the same in a few years. In the month of December The Ebensburg Coal Company, Colman and Weaver, bought 10,000 acres of coal land and founded the town of Colver, about six miles from Carrolltown, and four from Nicktown. During the year 1912, the Rt. Rev. Bishop sent a priest there to found a new congregation. A few of our families joined the new congregation. Notice was sent here that the Rev. Mother Teresia (Helena) Moser, O.S.B., superior of St. Scholastica Convent, Atchison, Kansas, died on October the 13th, 1911. She was born at Carrolltown on the 16th day of November, 1847, and made her vows on February the 10th, 1865. For many years Mother Teresia had been the leading spirit in the convent as well as in the acadamy and was highly esteemed by all who knew her. Very Rev. Prior Alcuin Maucher, O.S.B., of St. Bede Monastery died on the 31st day of January, 1913, and was buried in the St. Bede Cemetery. Brother Fabian, O.S.B., who left for St. Vincent Archabbey on December the 2nd, 1914, to spend the remainder of his days there, died on the 19th. The funeral took place in the Archabbey church. At the time of his death Brother Fabian was the oldest member of St. Vincent Archabbey both in age and in profession. In 1864 he came to Carrolltown where he spent 50 years of his life. He was born in Germany on August the 25th, 1827, and came to the United States in 1860. Brother Fabian was a kindly old man, a devout religious and all who knew him respected him and many expressed their regret that he had left for St. Vincent at so near the end of his life's career. On December the 18th, 1914, Prior Thomas bought from Thomas Illig, 2.295 acres of land for $1,000.00 This land was added to the cemetery and was blessed after High Mass on Sunday the 5th day of September, 1915. Some persons are under the impression that this piece of land, a parcel of the Hanna Schofield tract of land, at one time, had been presented to the church by Americ (Emericus) Bender. However the records in the Recorders Office at Ebensburg does not show that any lot or parcel of land was ever transferred or donated to the St. Benedict's Church by Americ (Emericus) Bender. VERY REV. THOMAS WOLF, O. S. B. Bachelor of Arts was conferred upon him at the age of 21 years. When he reached his 23d year he received the title of Master of Arts. He received his early education in St. Benedict's parochial school and his higher education in St. Vincent College. He was ordained on June 23 and celebrated his first Solemn High Mass on Sunday, July the 2nd, in St. Benedict's Church." The Franciscan Fathers from Cincinnatti, Ohio, gave a two week mission beginning on November the 12th and ending on November 26. The mission was well attended. The Rev. Alto Hecker, O.S.B., was born at Nicktown, Pa. At an early date his parents moved to Carrolltown, where he attended St. Benedict's parochial school. He made his higher studies at St. Vincent College, Beatty, Pa., and was ordained to the priesthood on the 25th of June, 1922. Father Alto celebrated his first Solemn High Mass in St. Benedict's church on July the 2nd, 1922. Father Alto is at present the assistant at St. Joseph's church, Johnstown, Pa. The Rev. Malachy Brawley, O.S.B., was also born at Nicktown, Pa. His parents also moved to Carrolltown and he made his primary studies in St. Benedict's parochial school. Father Malachy made his higher studies at St. Vincent College and was there ordained priest on the 22nd day of June, 1924. He sang his first Mass in St. Benedict's church on the 29th day of June, 1924. Father Malachy is the assistant at St. Vincent College. Prior Thomas not only paid off the heavy debt of the church but also made many important improvements. He enhanced the beauty of the church by placing a marble wainscoting on the inside walls. A new floor was laid in the church. The roof of the church and of the convent were covered with asbestos shingles. A good brick side walk was laid on Main Street in front of the church property. Electric lights were installed in the church, school and convent. The church was frescoed. In 1924 the sacristy was enlarged. The outside walls of the church and sacristy were reinforced by placing thereon imitation cement blocks in the form of broken range work. The tower received a coat of aluminum bronze, and the cross was gold plated. Strangers, passing through the town, admire the beautiful exterior of the church, which appears to be now a new church. In 1925 an Art Glass Firm of Bavaria placed beautiful art glass windows in the church. The pictures in the windows reproduce many events in the life of St. Benedict. The side altars were more elaborately decorated to conform to the rich Gothic style of the main altar. REV. CLAUDE GEARY, O. S. B. The St. Benedict E. B. A. Pictures are the unlettered man's book and have been the cause of many conversions as well as of enlivening the faith of those who read them. Carrolltown has excellent schools which are well patronized. Never-the-less there was a desire to see the unlettered man's books in the church windows. The following persons donated the artistic new stained glass windows in 1925. Christ manifest himself at Emmaus - The Children of Mary. St. Benedict receives two boys as pupils - Mr. and Mrs. Andrew Strittmatter. The temptation of St. Benedict - Mr. and Mrs. D. A. Luther. St. Benedict gives the Rule to the Monks - Henry, Mary and Margaret Holtz. St. Benedict raised the child to life - The Rosary Society. St. Ildephonse of Toledo and St. Peter of Clugny - Mr. and Mrs. John Smith. St. Willibald and St. Willibrord - Mrs. Margaret Yost. The annual conference of St. Benedict and his sister, St. Scholastica - Mr. and Mrs. Rembrandt Peale. St. Benedict sees the soul of St. Scholastica wing its way to heaven - Mr. and Mrs. C. A. Sharbaugh. The death of St. Benedict - The Holy Name Society. St. Gregory and St. Boniface - I. P. Strittmatter, M. D. LL. D.
St. Scholastica and St. Gertrude - Mr. and Mrs. Andrew Lantzy. St. Bennet and St. Dunstan - Mr. and Mrs. P. Morrell, Mr. and Mrs. P. C. Sharbaugh, Mrs. J. J. Sharbaugh, Mr. and Mrs. Thomas McConnell, Mr. and Mrs. Vincent Meisel, Mr. and Mrs. Frank Springer, Mr. and Mrs. O. H. Cozard, Mr. and Mrs. Joseph Fabry, Mr. Joseph Kaylor, Lawrence F. Flick, M. D. LL. D., Mr. Francis McCue, Mary Shalota, Fannie Wetzel, Elizabeth Illig, and Ilona Barborich. Mention also of the patrons of the church must be made in regard to Mr. Rembrandt Peale who for the last twenty-six years at least has supplied the church with all the coal which has been used for heating the buildings. Nor must Mr. John Ott and family with Andrew Strittmatter be forgotten, for they donated the beautiful double door tabernacle. Prior Thomas is a courteous priest, a fine scholar, an able and progressive pastor, whose future career of usefulness seems assured from past labors and present success. He has two good, able assistants in the Rev. Claude Geary, O.S.B., and the Rev. Clarence Kaiser, O.S.B. The church committee men are James Green, Joseph Huber, Philip Kirk, C. A. Sharbaugh, Peter Sharbaugh, A. A. Lieb and Clark Thomas. It is their duty to assist the Rev. Pastor in all temporal matters appertaining to the financial work of the church. In their sphere of duty they prove themselves of valuable assistance and their opinions and decisions in reference to the management and development of church property and finance are of the greatest assistance and importance to the Rev. Pastor from time to time. Mr. Hartly Cozard, the janitor, has the charge of digging the graves and keeping the cemetery in a fine condition. The church has always had the honor of having a good choir. The organists and leaders of the choir were Francis Grasberger, William C. Severin, Victor N. Maucher, Miss Hattie Sharbaugh, Miss Mildred Sharbaugh, and at present Edward Farabaugh. Contributed to the PAGenWeb Archives by Romayne Shay McMahon, 2005.